1 of 3 Heat oven to 425 degrees. 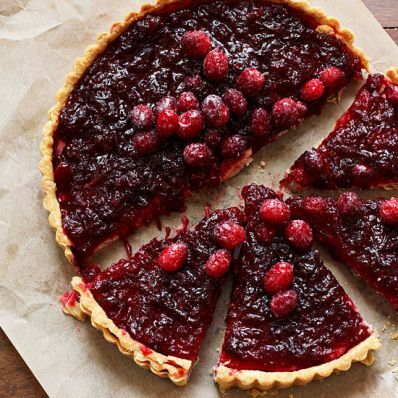 Fit piecrust into a 9- or 9-1/2-inch removable-bottom tart pan. Line with a double layer of nonstick foil, pressing against side of crust. Bake at 425 degrees for 18 minutes. Remove crust from oven, reduce heat to 375 degrees and remove foil. 2 of 3 Meanwhile, blend goat cheese, 6 tbsp of the sugar, the egg and milk in a bowl. Pour into crust. Bake at 375 degrees for 20 minutes or until set. 3 of 3 While cheese layer bakes, make topping. Combine remaining 1 cup sugar, the cranberries, cranberry juice, lemon zest and lemon juice in a saucepan. Bring to a boil and cook for 10 minutes over medium heat, stirring occasionally. Remove from heat and pour over baked goat cheese layer. Cool until set. Per Serving: 5 g sat. fat, 30 mg chol., 1 g fiber, 144 mg sodium, 5 g pro., 251 kcal cal., 9 g Fat, total, 38 g carb.